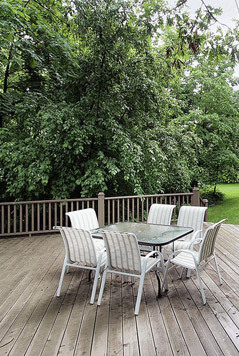 Have you ever imagined decking that allows you to spend more time outdoors? Whether it is for your home or business, we offer softwood and hardwood deck construction that allows you to capture a unique look to fit the rest of your surroundings. Our goal is to provide you with assistance every step of the way. Our first step is to survey, then plan, and then begin working on a design to match your needs. We will work hand in hand with you to ensure you are happy with the sketches before we proceed. Our skilled workers can use any type of wood that you desire, allowing you to get the colour and the durability that you desire. We have an incredible design team that has served us well in the past. We have produced single and multi-level decking designs in a variety of sizes, widths, and heights. We are happy to work on a design from scratch or work from an idea in your head or on paper. No deck is complete without the extras. We are happy to install lighting as well as other decking extras upon completion. This allows you to have a finished look without having to reach out to another vendor. There is no planning permission required on a deck if it not going to be more than 30 centimetres above the ground and, combined with other extensions or outbuildings, the decking or platform will not cover more than 50 percent of the garden’s area.